Former Phillies pitcher Cole Hamels fought back tears as he talked about his friend and former teammate Roy Halladay. The 40-year-old died Tuesday after his small plane crashed into the Gulf of Mexico. Roy Halladay, known as "Doc," arrived in Philadelphia after an all-star career with the Toronto Blue Jays. During the 2010 season, he joined a transformed team, which had won the World Series in 2008 and gone to the Series again in 2009. After years spent growing their own talent, the Phillies had traded for a big name. The city and the pitcher clicked immediately. Phillies fans loved Halladay's work ethic, loved the way he showed up early and talked humble. He was popular with his teammates. "I can still remember the first day we met," teammate Chase Utley wrote on Instagram. "It was 5:45 am on the first day of spring training ... his clothes were soaking wet. I asked if it was raining when he got in. He laughed and said, 'No, I just finished my workout.' I knew right then -- he was the real deal." And then there was the winning. "Doc was as driven a human being as I’d ever met in my life," said former teammate Scott Rolen. Halladay started Opening Day for his first season, in 2010, and gave up only six hits. He notched two shutout games early in the season. Halladay jerseys sprung up throughout the stands at Citizens Bank Park. On May 29, 2010, Halladay pitched a perfect game against the Florida Marlins. Later that summer, he gave 60 of his teammates and Phillies staff Swiss watches engraved with the date of the game. They arrived with a message that read, "We did it together. Thanks, Roy Halladay." By Sept. 21, he had won 20 games -- the first Phillie to reach that milestone in a season since Steve Carlton in 1982. "We will all remember Roy for his amazing moments on the field, how he dialed it up in the most important situations, how he competed and left his heart on the field every time he took the ball," said former teammate Brad Lidge. "But he was also an incredible dad, an incredible husband and an incredible teammate. He was quiet and thoughtful, but knew how to be playful. I competed against Roy since we were in Little League together and I will remember him in that way, and as a man." Halladay opened up the playoffs in 2010 in spectacular fashion, pitching a 104-pitch no-hitter in game one of the NLDS. He won the National League Cy Young award -- his second Cy Young -- in 2010. In 2011, Halladay was in pitching squad that lives on in Phillies history, which included Cliff Lee, Cole Hamels and Roy Oswalt. That year, Halladay was the starting pitcher for the National League in the All-Star Game. But by the 2013 season, Halladay was struggling with a back injury. When he decided to retire -- he signed a one-day ceremonial contract on Dec. 9, 2013 with the Blue Jays to retire in their uniform -- he took out a full-page newspaper ad, giving a "heartfelt thanks to Philadelphia." "As a baseball player, you realize that's something you can't do the rest of your life," Halladay said at the time. "I really don't have any regrets. You realize there's other things for you to accomplish in life." Roy Halladay was an exceptional athlete and a true gentleman. My thoughts are with his family. RIP Doc. Halladay was raised Mormon, and believed in family. Halladay met his wife, Brandy, when they were children; the two later reconnected by chance. They have two sons. "Roy was like a brother to me and we remained close after his playing days," said former Phillies manager Charlie Manuel. "I’m heartbroken for Brandy and the boys." Halladay also believed in giving back. While in Toronto, Roy and Brandy started a program to bring gravely ill children to a luxury suite at the Blue Jays' stadium. They called it "Doc's Box." As a Phillie, he supported Philabundance, which said in a statement Tuesday, "We will remember him for his perfection on the mound and for his longstanding partnership in the fight against hunger." He was a constant at charity events sponsored by the team and his teammates. He was an animal lover; Utley introduced Halladay to the Pennsylvania SPCA, which he supported with a popular Phillies' game night. Halladay also recorded public service announcements for the Humane Society of the United States. In July, Halladay united with a all-star lineup of MLB retirees as part of the Kansas Stars, supporting military families and veterans' causes. The last tweet on his verified Twitter account was in support of the Florida Burn, a youth baseball program. He gave money to the Pasco County, Florida sheriff's department to help them buy a K9 officer, the sheriff's department said. They named the dog "K9 Doc." That same sheriff's department was involved in the recovery effort after Tuesday's crash. "I’m blessed for having known him," Pasco County Sheriff Chris Nocco said Tuesday. 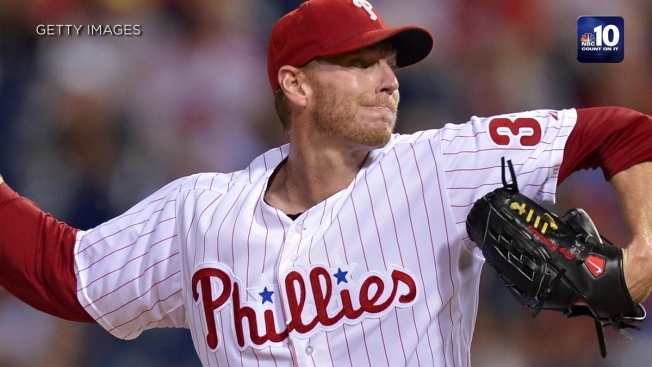 Through the years, Halladay never lost his connection to Philadelphia. He stayed involved with the Phillies, as a guest instructor. The Blue Jays issued a statement saying the organization was "overcome by grief" and calling Halladay "one of the franchise's greatest and most respected players, but an even better human being." "We are numb," the Phillies organization said in a statement. "There are no words to describe the sadness that the entire Phillies family is feeling over the loss of one of the most respected human beings to ever play the game."